Did you know that your vehicle’s Trailer Hitch has the ability to Increase the Risks of Injury to you and your occupants? The impact of a Rear End Vehicle Collision can cause painful injuries including soft tissue damage, and can be much worse on occupants if a trailer hitch is installed since it is attached directly to the frame. Most modern vehicles are designed to protect their passengers from the impact energy of a Car Crash with "crumple zone” safety features. However, when the hitch is inserted into the receiver so the "g forces” (Forces of Gravity increase the injuries) are transferred directly to the frame of the vehicle and the occupants bodies, there is the possibility for greater trauma since the impact could not be absorbed in the crush zones. For this same reason, it is typical to see the Property Damage be less severe with a lower cost to repair than it would have been had no hitch and ball been installed in the receiver. Approximately 75% of all rear end collisions are less than 10 mph, and Low speed Rear End Collisions (less than 10 mph) accentuate the Whiplash more than High speed ones. 94% of all rear end collisions occur on straight roads while 56% of all rear end crashes are straight on. 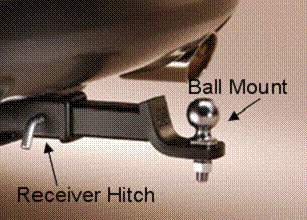 Only 14.2% of the people that hit you in the rear will miss your receiver hitch entirely. 48% of the people that hit you in the rear – are not slowing down. 80% of all rear end collisions are caused by driver inattention. Women are twice as likely to end up with a whiplash injury as Men.